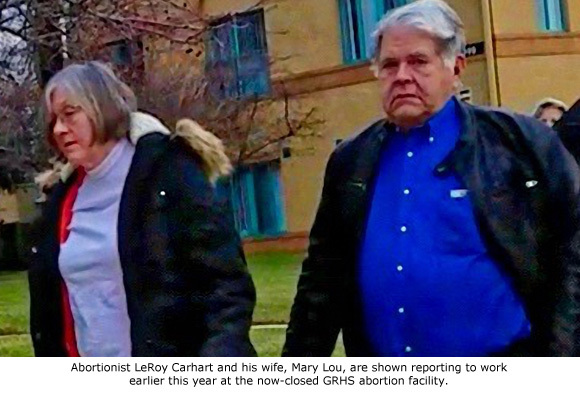 Germantown, MD – Nebraska’s all term abortionist LeRoy Carhart is suing the former owners of the now-shuttered Germantown Reproductive Health Services, a Maryland abortion business where he once worked, for custody of all GRHS’s medical records. Carhart is seeking declaratory judgement, which is a simple statement from the court to settle a dispute. No monetary damages are involved. In the case filed on September 14, 2017, Carhart asserts that he is the rightful owner of the medical records because the women were his patients, and not the patients of Germantown Reproductive Health Services where he conducted “advanced gestation abortions” between December 4, 2010 and August 24, 2017. Despite the reality that other abortionists also worked at GRHS on and off during that same time period, Carhart is demanding all medical records currently in GRHS’s posession. When Carhart asked for the records prior to filing the lawsuit, GHRS refused to hand them over. GRHS owners Nancy Samuels and Todd Stave, who are siblings that inherited the abortion business from their father in 2000, refute the notion that the medical records belong to Carhart, and note that GRHS has a legal responsibility to maintain the records – a responsibility they believe cannot be unilaterally transferred to Carhart. However, in their answer to Carhart’s suit, Samuels and Stave have offered to transfer the medical records in question to Carhart’s custody, as long as the court approves of the transfer and absolves them of any legal liability. “As usual, Carhart hysterically argues that the Boogie Man is after him, making outlandish claims that pro-life organizations have tried to do him and the GHRS staff harm, which, of course, is simply not true,” said Operation Rescue President Troy Newman. Operation Rescue first discovered that Carhart was hiring on as an independent contractor with GHRS in 2010, after his efforts to conduct “advanced gestation abortions” on babies in the late-second and third trimesters of pregnancy failed in Kansas and Nebraska due to opposition from pro-life groups, including Operation Rescue. Based on fifteen years of experience with Carhart, Newman suspects there are suspicious motives behind his suit. But, there is good reason to ascribe nefarious motives to Carhart’s actions. In 2009, Operation Rescue conducted an undercover investigation that found Carhart was training clinic workers to falsify ultrasound results by manipulating the transducer to achieve the desired gestational age. One former Carhart employee submitted a sworn affidavit to the Nebraska Attorney General’s office later that year, indicating that Carhart falsified the fetal ages. She recounted the incident of a minor girl who was beyond the legal gestational limit for an abortion in Nebraska, according an ultrasound examination by his nurse. The former employee alleged that Carhart falsified the fetal age so he could conduct the abortion illegally. A hearing date in the records case has been set for October 18, 2017.